The two brightest planets, Venus and Jupiter, will help you find a fainter one, Mercury, as all three shine together in the western twilight about half an hour after sunset Saturday, May 25, 2013, and for a few days after. Three planets will perform a rare celestial dance in the sunset sky tonight (May 26), a cosmic show that stars Jupiter, Venus and Mercury. "Triple conjunctions of planets are fairly rare," astronomer Tony Phillips explained in a NASA observing guide. "The last time it happened was in May 2011 and it won't happen again until October 2015." What sets tonight's planetary show apart from other conjunctions is that it includes the three brightest planets visible in the May night sky. Venus is the brightest of the trio, with Jupiter a close second and Mercury coming in third. 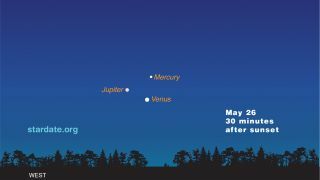 This NASA graphic shows how close Jupiter, Venus and Mercury will appear on the western horizon in the sunset sky on May 26, 2013. The three planets will appear within a 3-degree field of the night sky and should fit inside the field of view of a typical set of binoculars. For comparison, your closed fist held out at arm's length covers about 10 degrees of the sky. The three planets have been closing in on one another for tonight's sky show over the last week, but if you miss them tonight don't fret. The planet trio will still be visible on Memorial Day Monday (May 27) as their triangle pattern begins to separate, Phillips wrote. On Tuesday (May 27), Venus and Jupiter will appear extremely close together, separated by just 1 degree, in what could be a "truly spectacular pair," Phillips added.